Accessing Graphic Novels: Graphic novels, selected from a List provided on Blackboard, can be obtained either through school or public library or by requested access to the instructor’s iBook selections. Graphic Novel Choices: There is a Graphic Novel Selection List found in the “Getting Started and Texts” section of our Blackboard course. You are not limited to those choices and may pick something other than what is on that list with instructor approval. Why a graphic novel? : Not all comic books are meant for children, the same for graphic novels (often times longer form comic book stories or adaptations of films and literature). Scott McCloud, in his groundbreaking work Understanding Comics: The Invisible Art, refers to graphic fiction (a catch all term for pictorial representations that tell stories such as comic books and graphic novels) as “Juxtaposed pictorial and other images in deliberate sequence, intended to convey information and/or to produce an aesthetic response in the viewer” (17). 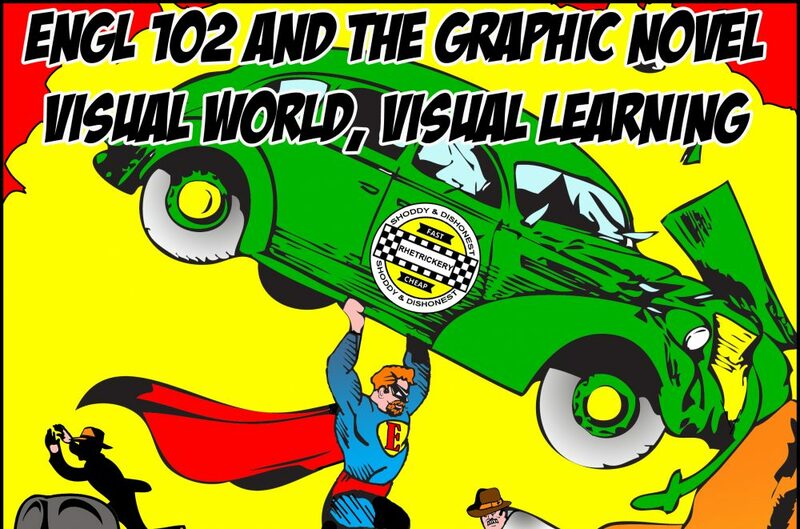 What this means is that graphic fiction are a series of images put together in a particular sequence (with or without words) that cause those who view them to gain understanding of the topic or subject depicted and/or simply to experience a pleasing artistic experience from the viewing. However, when most people think of comic books or graphic novels, they traditionally think of Batman and Robin, Superman, The Avengers, or the X-Men. Now, these characters do exist in comic books, graphic novels, TV, and movies (and more). But it needs to be considered that these characters can and do communicate ideas to an audience that can be deeper than onomatopoeia sound effects of “Boom” and “Pow.” In addition, comic books and graphic novels can be used to communicate, create, and convey other kinds of stories other than those about superheroes. People sometimes are unaware of this. I want my students to do something better. I want them to make better arguments. I want students to think critically about the world around them and to challenge them in this, I want to ask my students to write about Graphic Novels. I believe that graphic novels provide another layer to the critical thinking process for students by allowing them to engage with different texts both on a written or “perceived” level but also on a visual or “received” level as Scott McCloud relates it.